New York Times bestselling author R. A. Salvatore is the modern master of fantasy adventure. 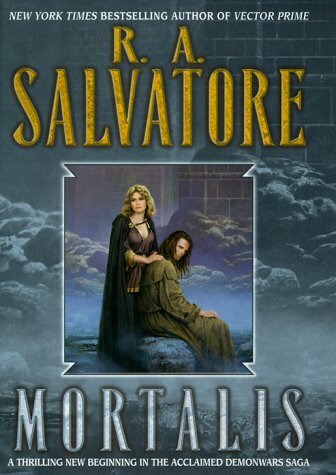 After creating the spectacular DemonWars trilogy--an imaginative tour de force hailed by critics and readers as his finest work yet--Salvatore has surpassed himself once again in Mortalis, the stunning first volume in a brilliant new DemonWars saga. Enter a world as rich in intrigue as it is in beauty, where humans, elves, centaurs, and other creatures are allies or enemies in a timeless conflict of good against evil. Yet despite the dactyl's demise, the kingdom still seethes in the same cauldron of plots and machinations. Was it for this, Pony wonders, that her beloved gave his life? Assailed by grief and doubt, Pony retreats to the northern lands where she and Elbryan once shared their brief happiness. There, among old friends, her wounded spirit can begin to heal. Then a deadly sickness appears suddenly among the people of Corona. Only Pony, with her supreme magical abilities, can heal the victims . . . or so she believes. But the plague resists her as if possessed of a malevolent strength and intelligence all its own. Now Pony must undertake a pilgrimage that will test her powers--and her faith--as never before. Watchful eyes follow her: The eyes of the elves, who have stolen something precious from her and keep it for their own mysterious purposes. And the eyes of the man she hates above all else: Marcalo De'Unnero, the villain responsible for Elbryan's death . . . who would desire nothing more than to lead Pony down that same treacherous path to destruction.